Hesburgh Library’s new North Entrance and Gallery are open and ready to welcome students and faculty back to campus. The new atrium, reading room and skylight mark the beginning of many transformative changes yet to come. Please stop by for a visit and see for yourself as we kick off the fall term. The North Entrance Gallery will be accessible using a new sidewalk at the northwest corner of the building. The remaining landscaping and sidewalks in the North Plaza will be completed in early September. 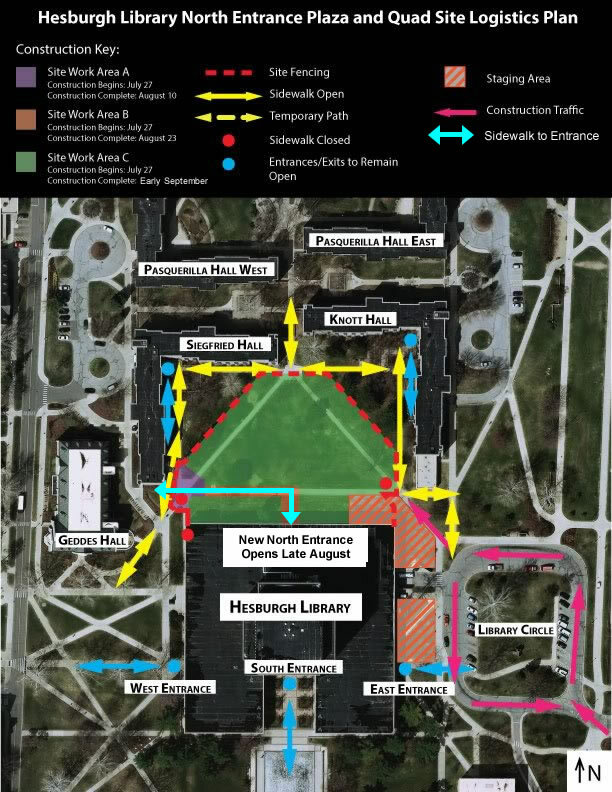 Download the site logistics plan for the Hesburgh Library’s North Entrance Plaza and Quad. The main south entrance will soon be closed until the completion of Phase 1-B in March 2016. Access will be through a temporary “Fishbowl” Entrance to the west of the main entrance. The Library Concourse will remain open. The grand staircase and other travel paths will be inaccessible during Phase 1-B. When in the building, look for maps, wayfinding flyers and directional signage to help with navigation during Phase 1-B. See all Hesburgh Library renovation updates online at renovation.library.nd.edu.